Ham and High, July 5, 2002. Cleaners at the Royal Free Hospital usually go unnoticed as they tidy up after the hundreds of patients, staff and visitors who use it every day. But one artist was so intrigued by their work that he wants to paint their picture. 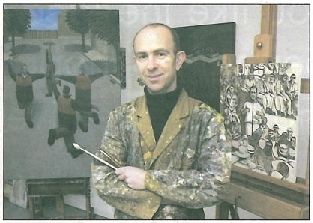 Simon Black became artist in residence at the hospital in Pond Street, Hampstead, last year after winning a competition. He was given access to all areas and departments of the busy hospital - and discovered that domestic staff were integral to the running of the building. Royal Free anagers are among the few NHS trusts in the country to commission an artist to work on-site. They hope that Mr. Black's artistic vision and insight into the hospital's working life will help make the building feel less like an institution. Since taking on the commission Mr. Black has been taking photographs in the laundry department, operating theatre and children's ward to get a feel for the place. "It felt a real sense of privilege at seeing and experiencing the things I did," said the 44-year-old. "I was invited into what turned out to be some intimate and private situations that are normally off-limits to the public, and gained a real insight into the heart of the Royal Free." The painter has just begun work on his first two pieces. One is a 4ft cnavas depicting surgeons about to enter the operating theatre, the other of medics on the children's ward. Once completed they will take pride of place on the walls of the Royal Free. The hospital is expected to eventually commission a further two paintings. "It didn't matter what job people did," Mr. Black explained. "After spending time with every department it was obvious that they were all dependent upon each other to make sure the hospital runs as well as it does." He said it was "very unusual to be commissioned by a hospital" but believes other trusts will soon catch on to the idea. "Art is a good way of creating a calm atmosphere so it's ideal in a hospital setting where people might be nervous," he said. Sarah Harrison, Ham and High.